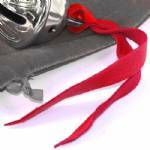 Soft deerskin lace for you to fasten to your own gift bells. The hand-cut lace is about 3/8" wide and 10" to 12" long. The color will be a bright red, similar to that shown. Two holes are punched in the lace for you to make the decorative "blood knot" as shown. Alternatively, you can tie a simple overhand knot in the lace after passing it through the bell. The holes will be hidden inside the knot. Sold per lace. The bell and the red velvet bag are sold separately.